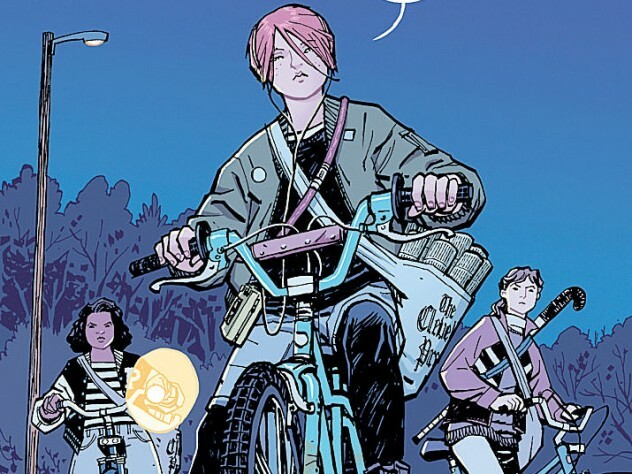 Cool Comic Debut: Paper Girls #1 Brings us an ‘Amblin’ Style 80’s Mystery! 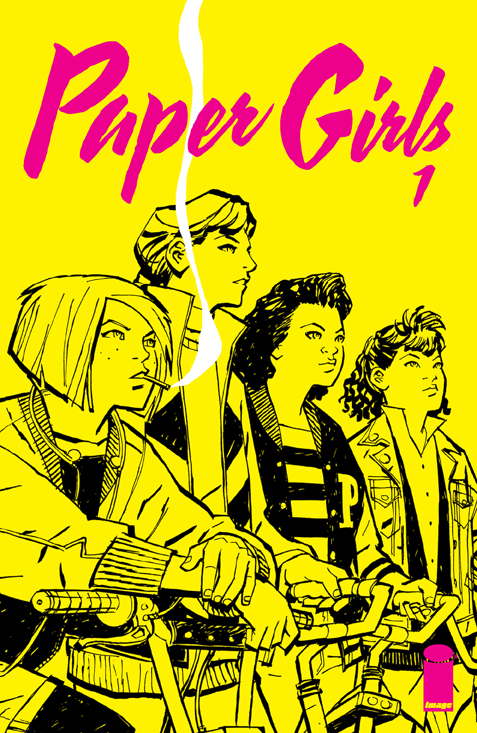 I just finished ‘Paper Girls’ #1 by hotshot writer Brian K. Vaughan and it’s one of best debut issues I’ve read in a long time. What’s even better is at it’s $2.99 cover price it’s a double sized issue filled with a great little story just waiting to burst into a retro ‘Amblin’ style adventure set way back in 1988. Not only do we get an intriguing story here but also some great artwork by Cliff Chiang. We follow twelve year old Erin as she heads out onto the streets to do her paper route in wee hours of the A.M. after a extremely peculiar dream, involving apples, aliens, winged astronauts and classroom demons speaking what seems to be gibberish. I love the way the dream sequence is played out in the pages here, with a ton of strange symbolism, conversations that seemingly make no sense and some frightening creatures, it really feels like an actual dream which is quite nice. The setting in the morning is the night after Halloween, so as Erin hits the streets with her sack of papers she encounters some neighborhood bullies still roaming. Luckily three other paper girls arrive on rad bmx bikes to the scene to her defense. From this point Erin decides to ride with the girls on her route and discovers that the three of them too had been jumped by some strange “people” dressed as ghosts who stole one of their walkie talkies. I don’t want to spoil any of the story as there are some cool surprises that develop along the way. But what I will say is this has the perfect setting for a lost 80’s flick and puts some cool supernatural elements in the mix that leave you longing for issue #2. A super solid debut and just the kind of comic book story that I love even if for some reason we get a bit of prominent product placement by the way of Apple computers. Check this one out, this issue gives you more bang for your buck too as it’s twice the normal size. A great scheme to get people to drop their hard earned cash these days on a comic book! ‘The Final Girls’ Transports Us Back In Time to a 1980’s Supernatural Slasher Flick! ! VHS Verdict: ‘The Kiss’ is Full of Campy Glamorous 80’s Horror!